Highly anticipated, the traveling exhibit of the great French couturier arrives in the French capital on April 1, along with a range of products echoing Gaultier's signature style codes and inspirations. Naturally, there is an entire series of products featuring the famous horizontal sailor stripe motif, including two mugs, two trays, pencils, an eyewear case, a bag, two pencil pouches, two placemats, two dishtowels and two aprons. Launched in 2009, the Junior Gaultier kidswear label has also come to the museum's gift shop in the exclusive "Junior Gaultier - Grand Palais - Paris" collection. Among the items offered are a sailor shirt, a sailor hat, a bandana, a pouch and Nono the teddy bear. 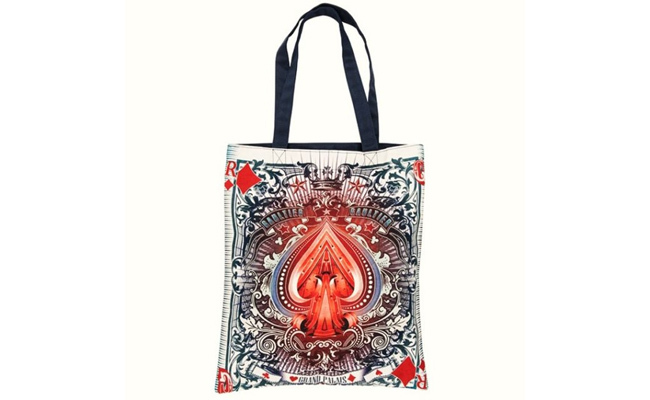 Fashionistas and other fans can also pick up souvenirs decorated with Jean Paul Gaultier's playing card print ("carte de jeu"), including mugs, trays, a business card holder, pencils, keychains, a bag, a pencil pouch and of course a set of playing cards. A range of stationery products will pay homage to the designer's style and distinctive references, including tattoos and corsets. Finally, the Grand Palais gift shop will offer products customized by Jean Paul Gaultier for other brands, including revamped Kusmi Tea tins.